This past weekend was pretty cool. We did lots of hiking, biking, and camping. It kicked off with my birthday on Friday. And I'm getting to the age where I'm supposed to hate my birthdays because they're reminders of how old I am. But I still like them because they're good excuses to eat lots of yummy foods. Then on Saturday, Russ took the foodie blogosphere to a whole new level with what is undoubtedly the most eloquent, inspiring review of frozen waffles in the history of mankind. 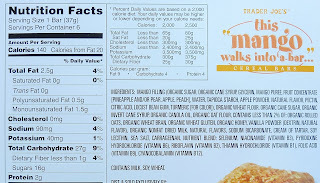 It seems a shame to follow it up with this mundane look at cereal bars. But in the end, not every breakfast food review can be a transcendent, life-changing experience I suppose. Also, I took video of a cow on the freeway with my phone and it wound up on the evening news. Then Sunday was Father's Day and I spent it taking a walk with my dad and picnicking in a nearby park. Good times all around. 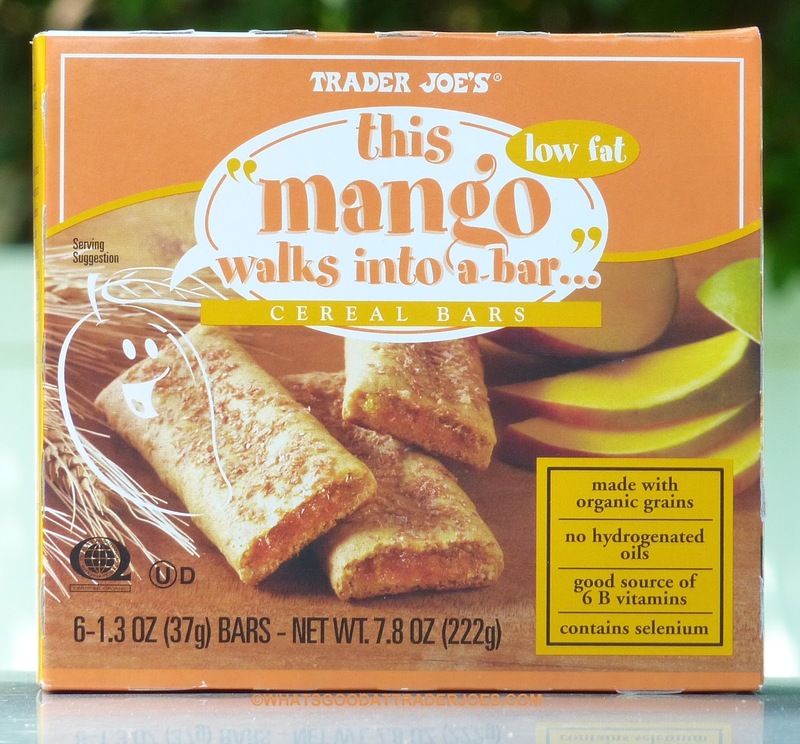 Through it all, I was snacking on these "this mango walks into a bar" bars. I like them at least as much as their predecessors. See: strawberry/blueberry (complete with terrible "walks into a bar" jokes) and pumpkin varieties. Texture-wise, they're exactly like the other flavors. The cereal-esque coating looks and tastes exactly the same. It's moist, it's bready, and it does what it's supposed to do—holds the fruit filling right in the middle of the bar. And as far as the fruit filling goes, I was pretty impressed. 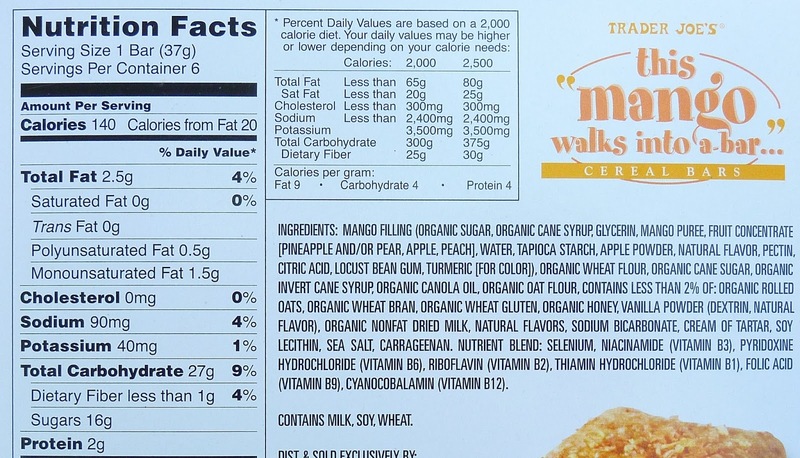 It tastes like mango, it's significantly sweet, and there's plenty of it. Sonia thinks they're "not bad" and gives them three and a half stars, adding that she quickly got bored of them after her initial pleasant reaction. I see where she's coming from, but I think they're better than "not bad" and have to throw out four stars here, as I have with all previous incarnations of "walks into a bar." Since they have fruit walks in a bar. Why not they just change up to "this cake walks in a bar" or even cookie butter filled bar. Uh oh..."this cookie butter walks into a bar..." sounds dangerous! I miss them..I want them back..as they said they aren't coming back..ughhh what do I do now..brokenhearted. .